Allergies are a sign that the body is out of balance. An allergy test can pinpoint specific substances which are causing illness. Desensitisation, using homoepathic remedies, will enable the body to recreate homeostasis, or balance . Anybody. The youngest person I have muscle tested is 5 years old and the oldest people are well in their eighties! For the very young, or people who are too unwell to test, a surrogate can be used. Another person will "touch in" on the client and testing will then go ahead as normal. Reflexology is suitable for babies and can benefit people of any age group. EFT was developed by Gary Craig, who has successfully used the tapping method for a wide range of physical, mental and emotional problems. Perhaps some of his most outstanding work has been with Vietnamese war veterans suffering from PTSD. If you would like more information, advice, or would like to book an appointment please contact me for details. 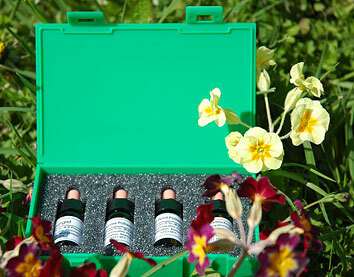 Homeopathic hayfever remedy kits are now available for you to buy direct. Previously only available to registered Allergy Therapists, you can now order them online. One 5ml bottle of homeopathic plant pollens - taken for one week, then weekly during the pollen season. It is recommended you take these remedies for two seasons, but most people find significant relief during the first season. Price per kit to a UK address is £41 plus £2.95 postage and packing.